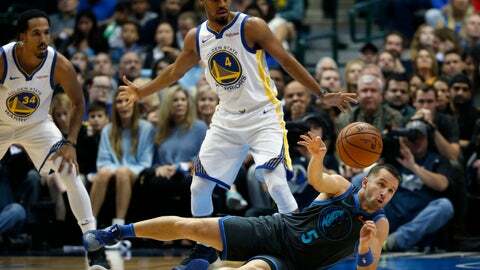 DALLAS (AP) — Luka Doncic gave the Dallas Mavericks a glimpse of an exciting future — and extended a bad week for the Golden State Warriors. The rookie scored 24 points, including a short jumper that put Dallas in front for good, and the Mavericks beat the Warriors 112-109 on Saturday night. The 19-year-old from Slovenia arrived in the NBA having led Real Madrid to the 2018 Euro League title. On Saturday, he hit a 10-footer in the lane with 1:10 left to put Dallas up 109-108, then sealed the game with two free throws with seven seconds remaining. Golden State played without injured starters Stephen Curry and Draymond Green and lost for the fourth time in six games. The Warriors dropped back-to-back games for the first time this season, and Saturday they led by eight points in the second half before the Mavs rallied. Kevin Durant scored 32 points, but only three in the fourth quarter on 1-for-7 shooting. Klay Thompson added 22 for the two-time defending NBA champions. Durant missed two shots and Thompson one in the final minute, all of which could have either tied the game or put Golden State ahead. Harrison Barnes had 23 points for the Mavericks, who have won four in a row. It was just the second time Dallas has beaten Golden State in their past 19 meetings, the other coming on Dec. 30, 2015 — one of only nine games the Warriors lost that regular season. An 8-0 Mavs run early in the fourth quarter, capped by Dwight Powell’s three-point play, gave Dallas its first lead since early in the third quarter, 93-92, with 9:18 to play. After Golden State surged ahead again, the Mavericks hung tough and Dorian Finney-Smith’s fast-break layup put Dallas back up 107-106 with 1:45 remaining. In addition to missing Curry (left groin strain) and Green (right toe sprain) in the midst of this rough stretch, the Warriors are still trying to repair the bad feelings caused by Green’s dust-up Monday night with Durant and subsequent suspension. Dallas, a 76 percent free throw-shooting team for the season, struggled in going 22 of 34 at the line, though Doncic came through when it mattered most. Dennis Smith Jr. was 2 for 7, and Barnes was an uncharacteristic 7 for 11. “I love that we are getting to the line, to put a positive bent on it,” Carlisle said. The Warriors got valuable contributions from reserves Quinn Cook and Damion Lee, the latter playing on a two-way contract. Cook scored 15 points and Lee a season-high 13. Lee had 11 first-half points, the same amount he had scored in 24 minutes of action all season prior to Saturday. He had eight points in a 22-11 second-quarter run that gave Golden State a 44-37 lead. Warriors: Durant and coach Steve Kerr received technical fouls for protesting when Durant was called for traveling after being bumped in a Mavericks double-team with 1:01 left in the first quarter. Barnes’ ensuing free throws gave Dallas its biggest lead, 26-18. … Kerr said Green would “almost for sure” miss the team’s game Sunday at San Antonio and then be re-evaluated before the Warriors host Oklahoma City on Wednesday. … Curry said he was hopeful he would return to action later this month as he continues his rehab. Mavericks: Wesley Matthews missed his second game in the past three with a left hamstring strain. He played 20 minutes Wednesday against the Jazz. … Smith, a 2018 Slam Dunk Contest finalist, had an embarrassing moment in the first quarter when he missed an uncontested breakaway attempt. He went up two-handed and slammed it hard off the back rim. Warriors: Finish their three-game Texas trip Sunday at San Antonio. Mavericks: At Memphis on Monday, the Mavericks’ only road game in a five-game stretch.